We do not use PP bath (concentrated PP dosage) as part of maintenance. We use it when discus are very sick. Use wrong dosage, you destroy fish tissues. We do use PP overnight (light PP dosage) as preventive and maintenance treatment. and also how to do the overnight treat meant if the water doesn’t stay purple ( not even one minute ) with my tap water ???? PP is a active caustic alkali and at high dosage, it burns organic matter very fast. That is why we only use PP bath as the last resort to save the fish. You do not leave the fish overnight at high PP dosage, it will burn all bad and good tissues. If PP does not stays purple, it means the water contains chlorine or other chemicals. Using PP in this water quality is useless. You need good water quality or aged water from tap. Your newly bought discus fish, born in a farm environment, have never known what a plant or how a plant smells like. They need your help to adjust to the new environment that you are providing. How well your discus adjust to their new environment will depend on your skills and knowledge as a hobbyist to make them as comfortable and stress free as possible. Do not put new fish into your main aquarium straight away when you receive them. Keep them in a separate tank, allowing them to rest. You do not want other fish to disturb them when they have no strength to defend themselves. Also to safeguard your current collection of fishes against disease outbreak. Quarantine new fishes for at least a period between four to six weeks. You can shorten the quarantine time if you buy the fishes from the same reputable source. The fishes would have been quarantined before sale and treated for any diseases that may have been present. 3)	Feed small amount of frozen bloodworms or granulated dried food and remove all uneaten food. They may not show their best of appetite but the hobbyist need not worry. Given the time they will eat. 5)	Transfer an existing fish into the quarantine tank with your new fish and observe for a few days. If all is well, then it is safe to transfer the fishes into your show tank. I have recently acquired a breeding pair of discus, both seemed fine for the first month but my male has started to show like a fungal/mucus growth on his fins which now appear to be clamped and the females fins are clamped and she is rapidly breathing out of just one of her gills and both are now hardly feeding. I have tested water quality for ammonia, nitrite and nitrates and all is spot on but I have noticed today what looks like a very thin wriggly thread worm that is swimming around if you closely in the water and there seems to be several of these in the tank have you any suggestions at all as to what these can be? Put the pair in a bare tank. Treat them with Potassium Permanganate solution. Repeat the treatment for a few days. Rapid breathing show gill problems. I bought them when they have been 2 months old. they were good shape and size. . Then I found them breathing very often. I treat them with metronidazole. Don’t help. I think it is getting worse. Plus my water is cloudy. 50 gl tank ph about7. middle hard water 6 discus $ moths old each. plus 1 SaE and 3 otos. water chages every other day 20-25%. Breathing very rapidly is because of gill problem. Metronidazole is to treat worms. 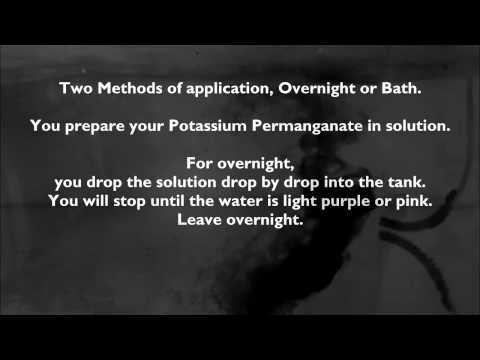 Do Potassium Permaganate bath then continue light dose for over night. Repeat the treatment for 3 days. My discus is orange and turquoise and has always changed colors a little. In the last week, however, it will turn almost black, stay that way for a few minutes, then slowly turn back. The water temp is always in the 84 degree range. the only thing that I can think of that was different is the tank was changed twice in one week instead of every other week (I went on vacation and my roommate thought it would be nice. )She also added a couple of catfish and danios. When the fish is dark it shows she is not feeling well. When it turns black it tells that the fish is sick. Apply Acriflavine solution add salt.